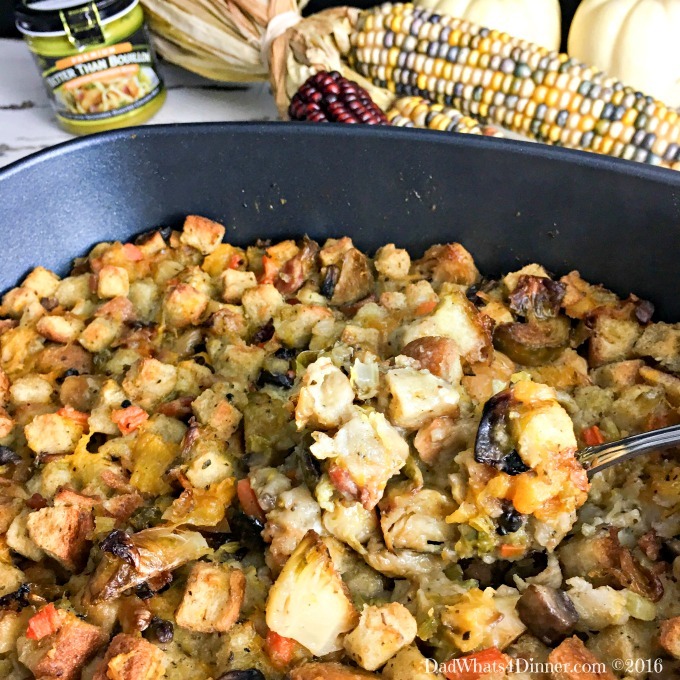 This Thanksgiving try a new twist on stuffing with this Roasted Brussels Sprouts and Butternut Squash Bread Stuffing. 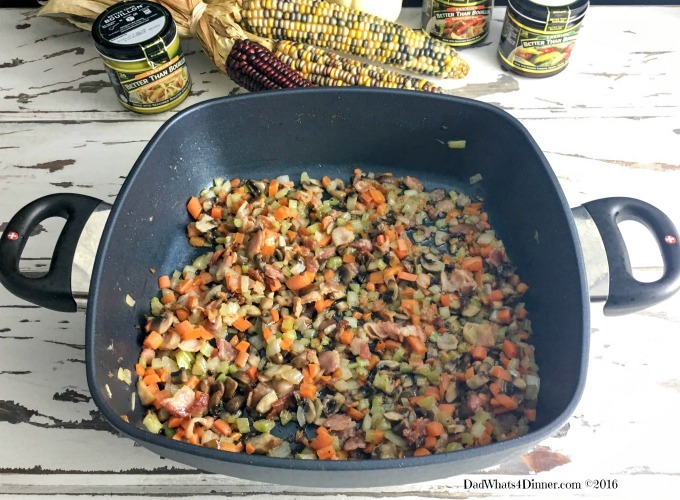 Lots of veggies and full of flavor! 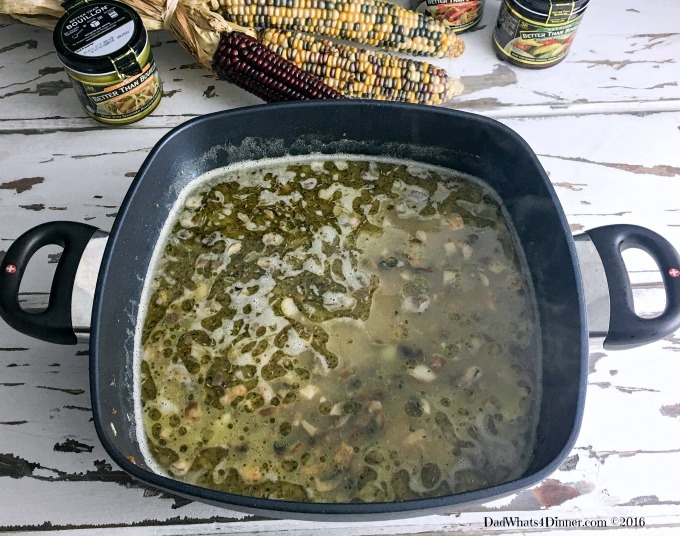 It is down to crunch time to figure out what you are making for Thanksgiving Day dinner. 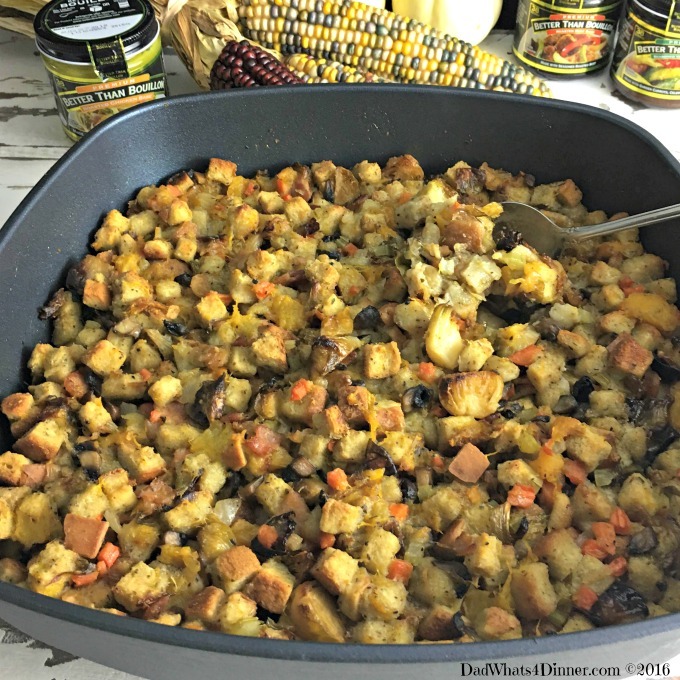 I have always been a fan of stuffing and have made all different types over the years. I like to experiment with different combinations of flavors. 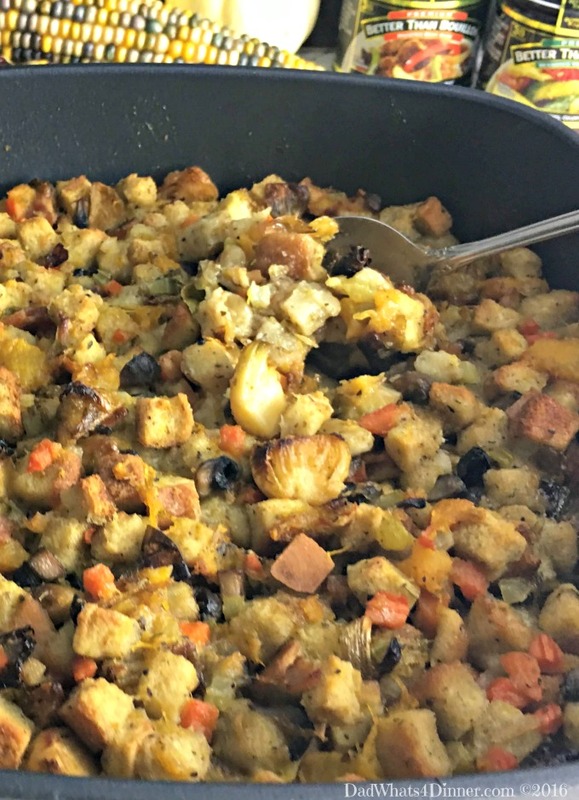 My niece and I have a friendly competition each year to see who can make the best stuffing. Let’s just say, she is a very good competitor. 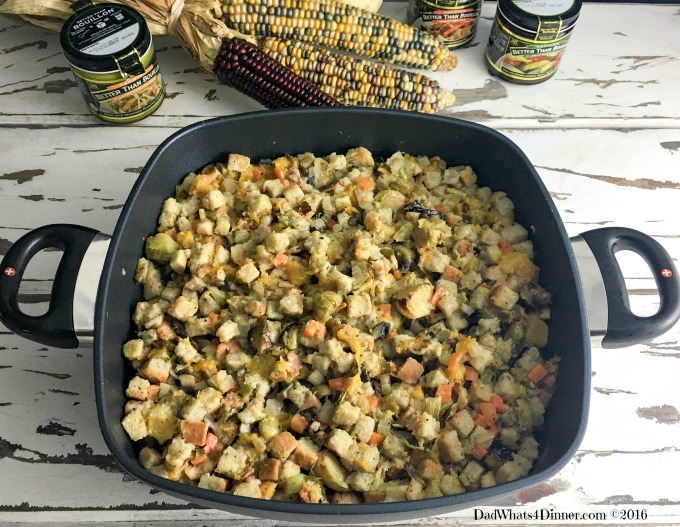 This year I decided to go a new route and make a roasted vegetable stuffing using Brussels sprouts and butternut squash. 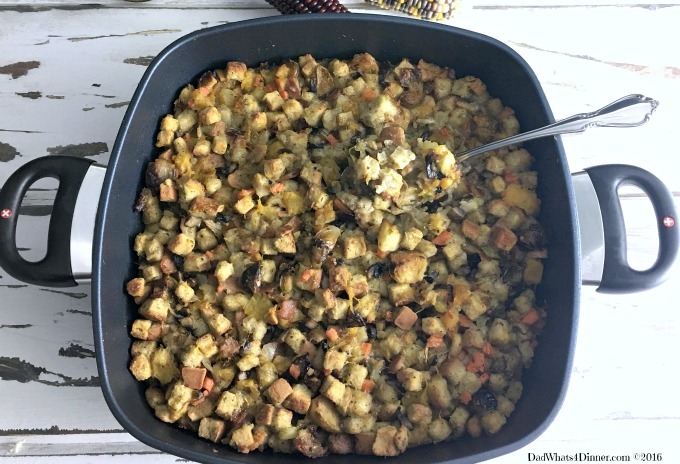 When I first told my wife I was going to make this Roasted Brussels Sprouts and Butternut Squash Bread Stuffing she did not approve. Even though she loves Brussels sprouts, she couldn’t imagine them in a stuffing. So when she tasted it, she thought it was the best stuffing she had ever had. You think she would trust me by now! This time of year I use lots of broth and stock in my cooking. 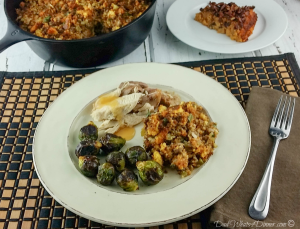 For my Roasted Brussels Sprouts and Butternut Squash Bread Stuffing, I used Better Than Bouillon® Roasted Chicken Base Premium Roasted Chicken Base to make my broth. Better Than Bouillon® bases come in different flavors such as chicken, vegetable, beef and is available in low-sodium and organic varieties. The bouillon paste is reconstituted with boiling water to make broth or it can be used as a base for stews, soup, and other recipes. I love the clean robust flavors and the fact that I can make just the amount of broth I need. Once the container is open the Better than Bouillon® base stores conveniently in the fridge so it doesn’t take up a lot of my pantry space. Another problem this time of year is dishes, dishes, dishes!! I hate dishes! This is why I do the cooking and my wife does the dishes. This recipe uses only one pan from start to finish. How awesome is that! My wife loved me for that. I used my new Swiss Diamond 11 inch square pan. 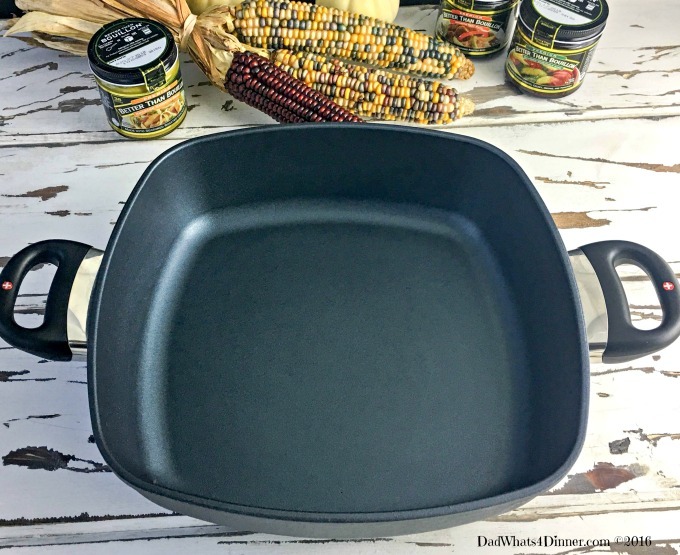 The Swiss Diamond cookware is the best non-stick equipment I have ever used and the great part is the pan can go from stovetop to oven without the fear of the handles melting. I want to replace all my old cookware with Swiss Diamond. Pre-heat the oven to 425°F. 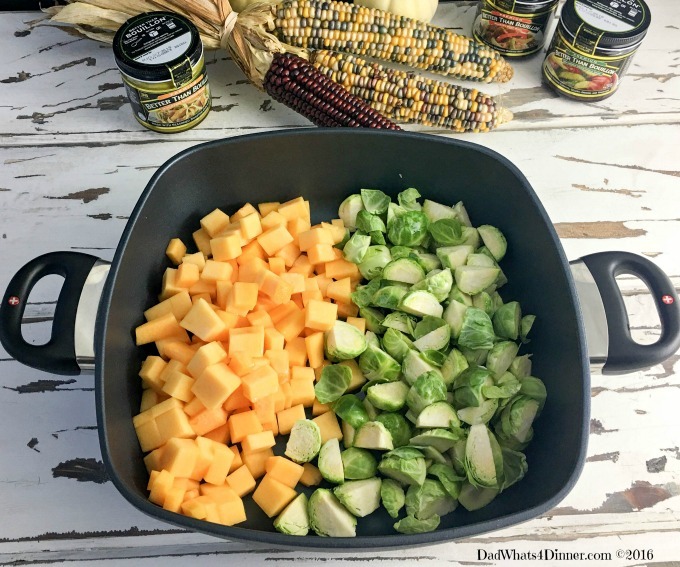 Drizzle the Brussels sprouts and butternut squash with olive oil in an 11″ x 11″ deep pan. Roast in the oven for 40 to 45 minutes; stirring occasionally. Remove the roasted Brussels sprouts, squash from the oven and reduce the heat to 375°F. Combine the bread cubes with the roasted Brussels sprouts and the squash in a large bowl. Heat the same pan over medium heat and add the butter and bacon pieces. (Isn’t this awesome that we are using the same pan!!) When the bacon is cooked, add the celery, mushrooms, carrots, onions and cook until soft, 6 to 8 minutes. As your veggies cook, combine the Better Than Bouillon® Roasted Chicken Base with the boiling water and whisk until completely dissolved. Pour in the chicken broth with the veggies and then add the Italian seasonings. Stir until combined. Cook for a couple of minutes until heated through. Gradually ladle the broth and veggies into the bread, sprouts and squash mixture. Tossing lightly to combine and all ingredients until moistened. Add a little salt and pepper. Return the dressing mixture back into the same pan and bake until golden brown on top, 25 to 35 minutes. Yum!! 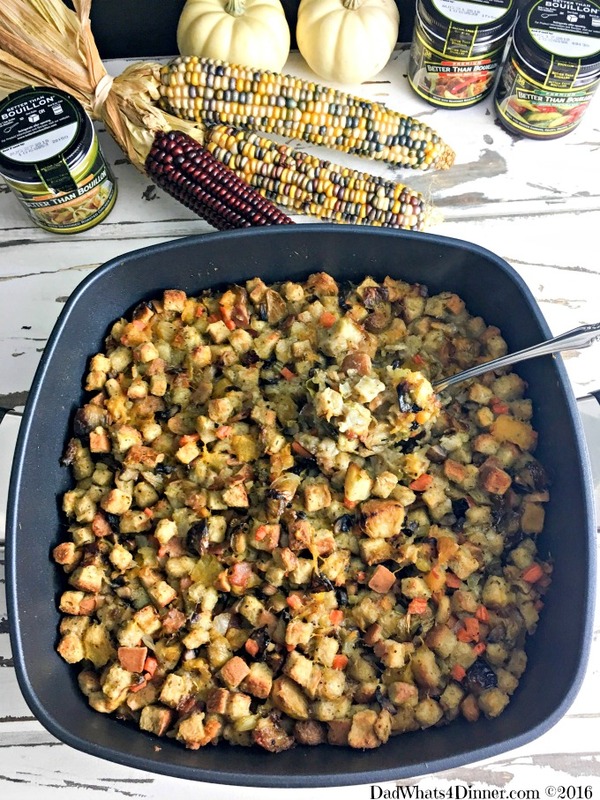 What is your favorite Thanksgiving stuffing recipe? 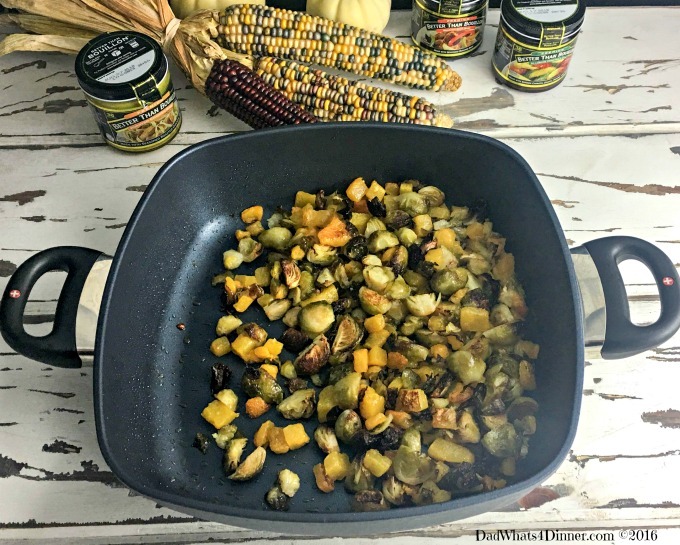 Drizzle the Brussels sprouts and butternut squash with olive oil in a11in x 11in pan. Roast for 40 to 45 minutes. Stirring occasionally. Remove the roasted Brussels sprouts, squash from the oven. Reduce the heat to 375°F. In a large bowl combine the bread cubes with the roasted Brussels sprouts and the squash. 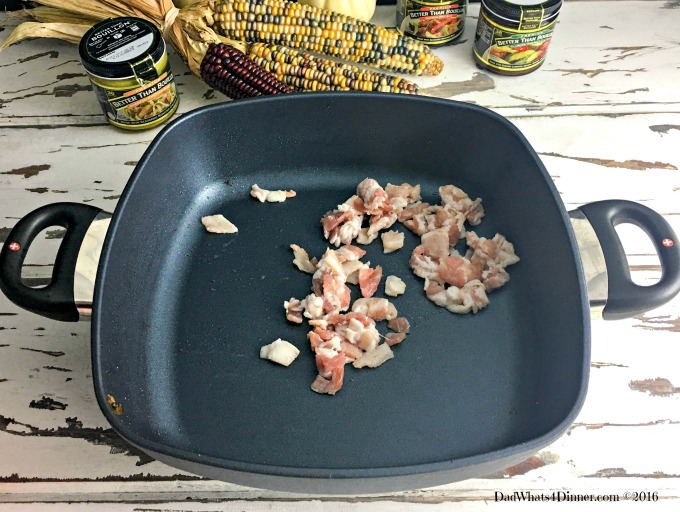 Heat the same pan over medium heat and add the butter and bacon pieces. When the bacon is cooked, add the celery, mushrooms, carrots, and onions and cook until soft, 6 to 8 minutes. As the veggies cook combine the bouillon with the boiling water. Whisk until completely dissolved. Pour in the chicken broth, then add the Italian seasonings. Salt and pepper to taste. Stir until combined. Cook for a couple of minutes until heated through. Gradually ladle the broth mixture into the bread, sprouts and squash mixture. Tossing lightly to combine and moisten all ingredients. Add a little more salt and pepper, if needed, to taste. Place the dressing mixture back into the same pan and bake until golden brown on top, 25 to 35 minutes. 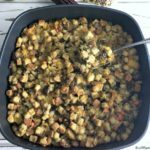 I will be bringing my Roasted Brussels Sprouts and Butternut Squash Bread Stuffing recipe to Freedom Fridays, Friday Favorites, Fiesta Friday, Weekend Potluck, What’s Cooking Wednesdays. Checkout my Link Parties page for other great places to find new recipes. Brussels sprouts are so delicious and should be eaten more! 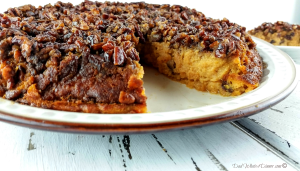 Thanks for bringing us another, and delicious sounding recipe! Even though Swiss Diamond provided me with this pan I don’t throw around accolades lightly. I was very impressed and would love to buy more. They are expensive but as they say you get what you pay for. Happy FF! 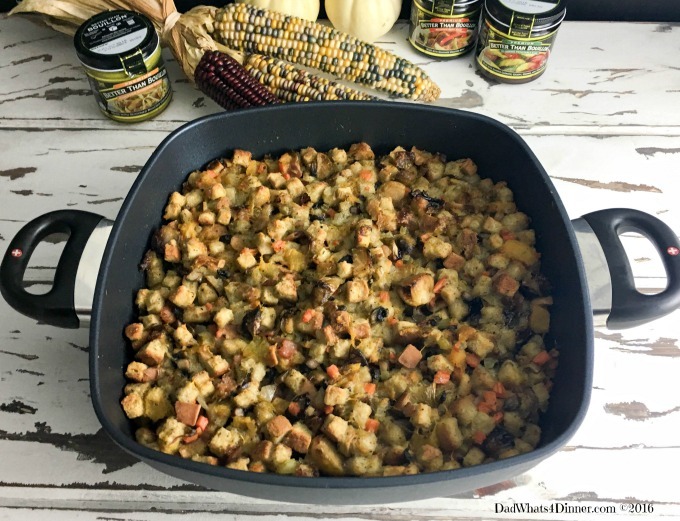 What a fun take on stuffing and I love that you did it an electric skillet! Frees up the stove for the giant turkey!! Oh no! Did I say it was an electric skillet. Swiss Diamond would not be happy. No just made it in one skillet that is over proof. BTH the stuffing is awesome. Oh no!!! I just thought!~! I guess I am guilty of skimming the reading! Sorry Swiss Diamond! !